Imagination can run riot when investigating the microscopic anatomy of algae. 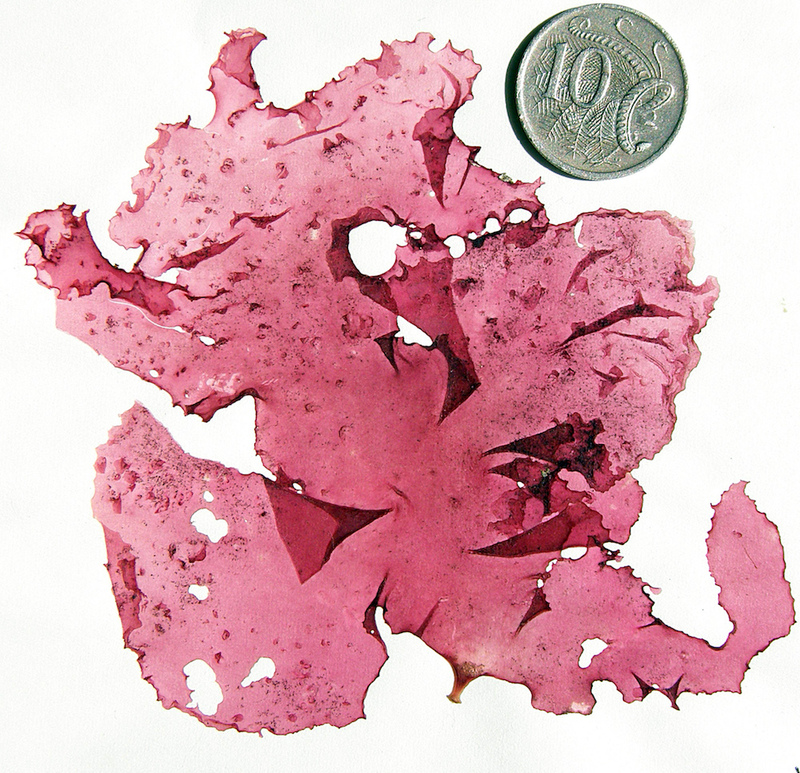 A rather beautiful alga from Western Australia (Cryptonemia species) looks relatively ordinary from the outside—but, when tissues are squashed, expelling the unusual internal cells, a new world of cell shapes is revealed under the microscope. What does the image of the large central cell remind you of? It is, in fact, of a ganglioid cell, unique to some members of the family Halymeniaceae. It gets its name because of the resemblance to the shape of a type of nerve cell found in animals, but as far as we know, doesn’t transmit impulses along its long arms as happens with animal ganglionic cells. In fact, the scientific literature is silent on its function. 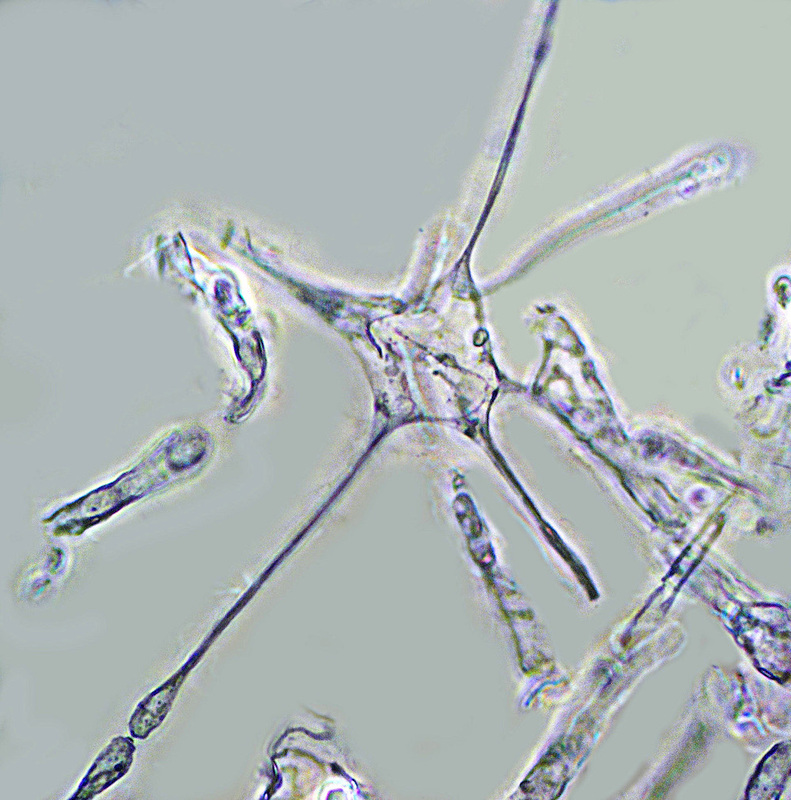 A similarly unusual cell type from the Kallymeniaceae is the stellate cell. It comes from inside membranous blades, in a similar position to that of ganglioid cells of the Halymeniaceae, and has short, radiating arms. Again, nothing is definitive about its function. For more information about the genera with these cell types look at our Algae Revealed series. 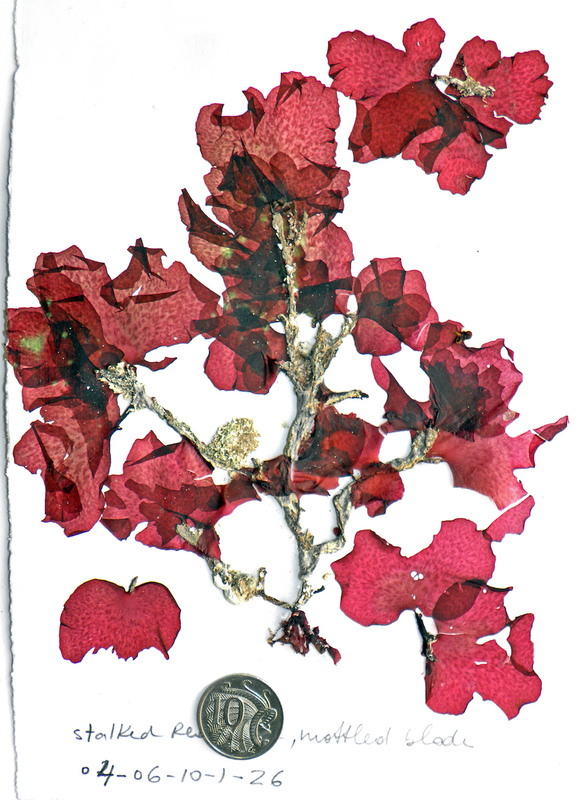 Contributed by State Herbarium Honorary Research Associate Bob Baldock. This entry was posted in The Plant Press on 6 August, 2018 by Ainsley. The colourful flowers of Amyema miquelii (box mistletoe), our Plant of the Month for March, 2018, provide an important nectar source for birds and insects at this time of year when few other plants are in flower. 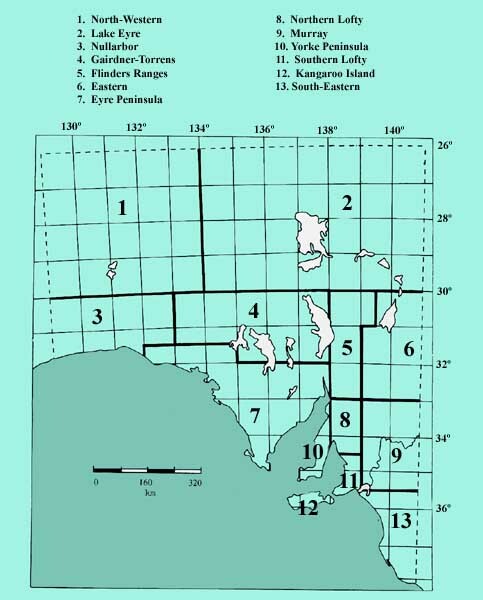 It occurs in all Regions of the State with the notable exception of Kangaroo Island (see map on eFloraSA). Amyema miquelii flowers. Photo J.G. Conran. Mistletoes are native, woody, hemi-parasitic plants. Their sticky seeds are dispersed by birds and germinate on the branches of trees or shrubs, forming an attachment known as a haustorium that penetrates the wood of their host. They are dependent on the xylem sap of their hosts for water and nutrients but have leaves with chloroplasts to produce their own food by photosynthesis. 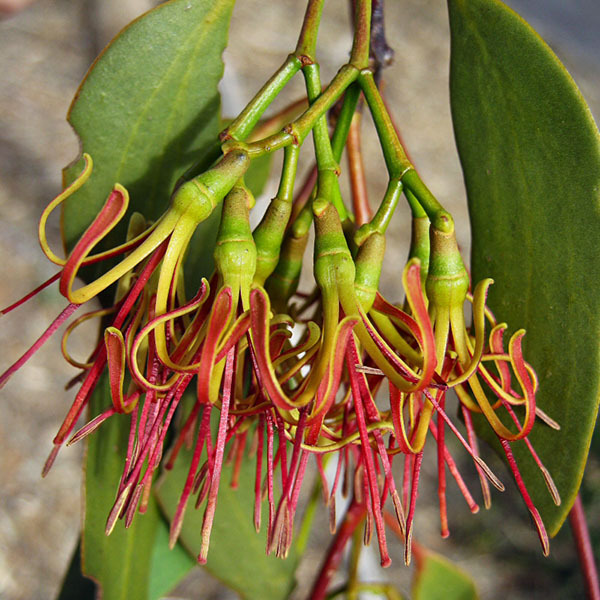 South Australia has 17 mistletoe species in four genera of the family Loranthaceae. Further information can be found in the 5th edition Flora of South Australia family treatment available here (3 MB pdf). Mistletoe species vary in their host specificity. 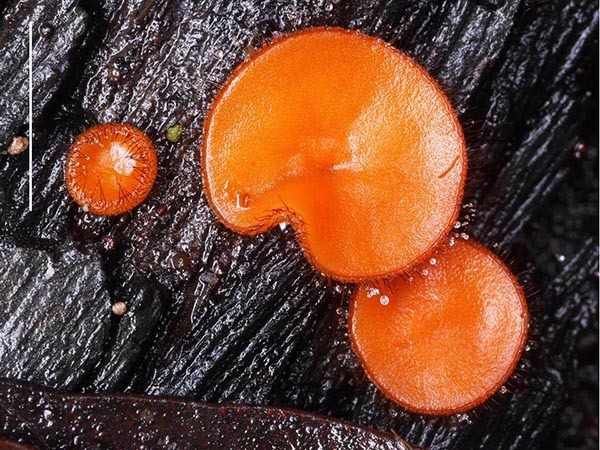 Amyema miquelii is usually parasitic on eucalypts (Cormybia & Eucalyptus) and is only rarely found on other genera. Within the eucalypts, it shows a strong preference for box-barked species (such as Eucalyptus microcarpa, grey box, in the Adelaide area), and some smooth-barked gums that are related to the boxes such as E. fasciculosa (pink gum) and E. leucoxylon (SA blue gum), as well as number of mallees mainly from the red mallee group. 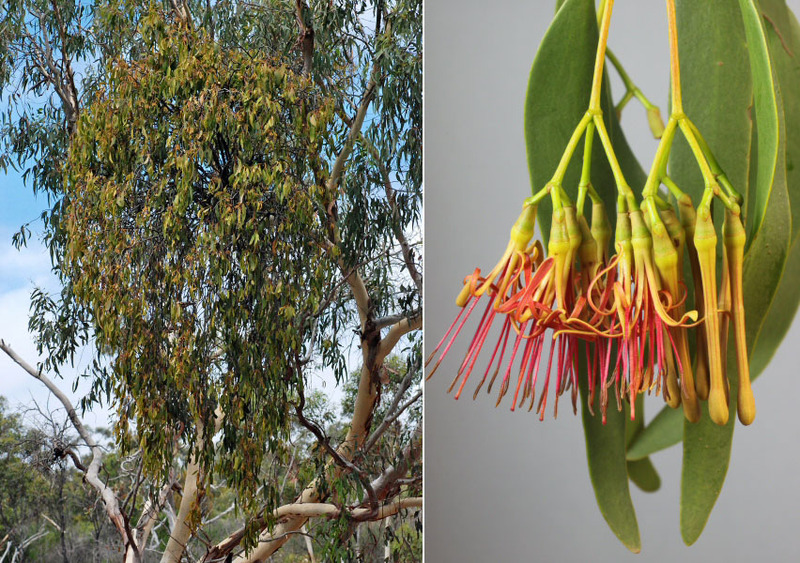 Its drooping, falcate leaves mimic those of its eucalypt hosts. Amyema miquelii habit (left, photo: J.G. Conran) and flowers, buds and foliage (right, photo: P.J.Lang). 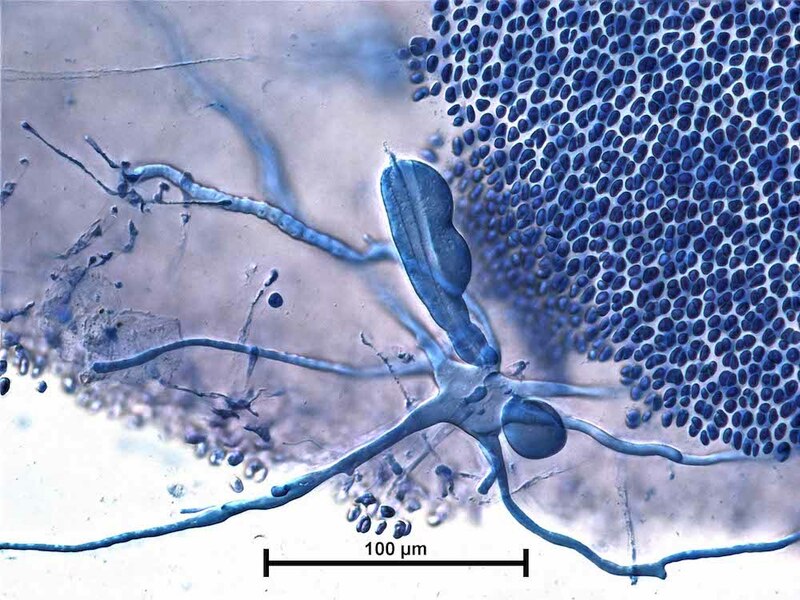 Amyema pendula is the most similar species to A. miquelii and is sometimes confused with it. Its leaves are of a similar shape but tend to have more obvious parallel venation and a somewhat rusty tomentum. It is most clearly distinguished by the flower clusters which have the middle flower sessile (lacking a stalk). There is very little overlap with A. miquelii in its host preferences. Amyema pendulum is most commonly found on the stringybarks (Eucalyptus arenacea, E. baxteri, E. obliqua), and on selected gum species (E. viminalis, E. camaldulensis, E. ovata), as well as Blackwood Wattle (Acacia melanoxylon). 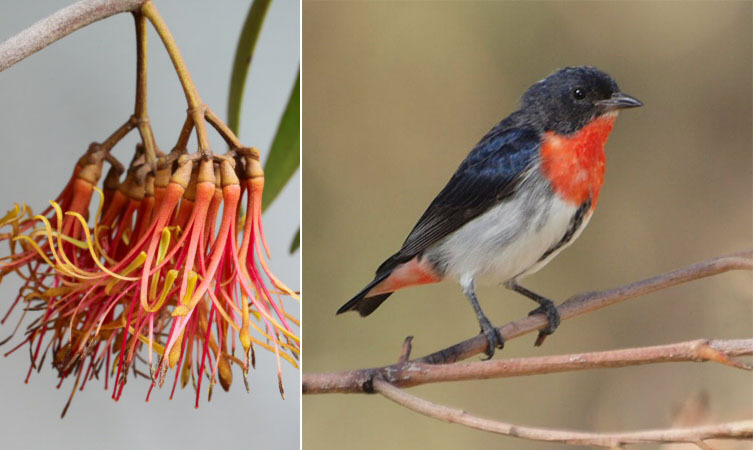 Amyema pendula flowers (left, photo: P.J.Lang), Mistletoe bird (right, photo: Duncan McCaskill, CC BY 3.0, cropped). Mistletoes fruit form a principal component of the diet of the mistletoe bird (Dicaeum hirundinaceum), and in turn the bird has evolved to become a major disperser of mistletoe. They have a simple gut that can obtain sugars from the mistletoe fruit and pass it rapidly, avoiding damage to the embryo and leaving the sticky coating relatively intact. Furthermore their specialised perching behaviour helps position the defecated seeds on the host plant branches. Mistletoe birds are widespread across mainland Australia but absent on Kangaroo Island which may account for the lack of mistletoes species there. 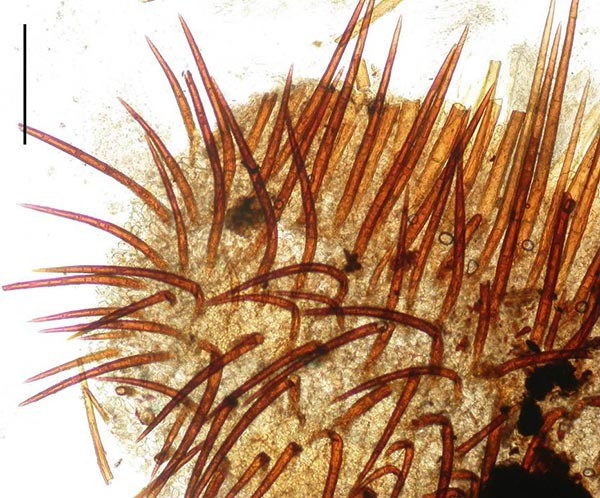 This entry was posted in The Plant Press on 2 March, 2018 by Jürgen. A few months ago, State Herbarium botanist Peter Lang and SA Seed Conservation Centre‘s Dan Duval, were part of a field trip to Arckaringa Station. 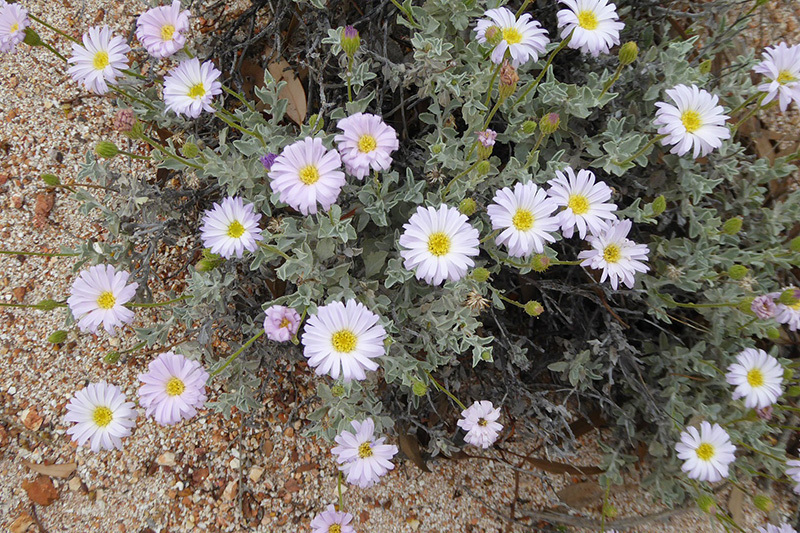 One of the main aims of the trip was to survey populations of Olearia arckaringensis P.J.Lang, the State Herbarium of South Australia‘s Plant of the Month for February 2018. Olearia arckaringensis, flower. Photo: A.C. Robinson. 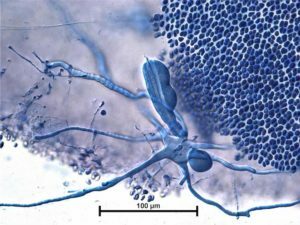 The plant was first discovered in 2000 in gullies of breakaways in an isolated pocket of Arckaringa Station by DEWNR scientists Rob Brandle and Peter Lang. 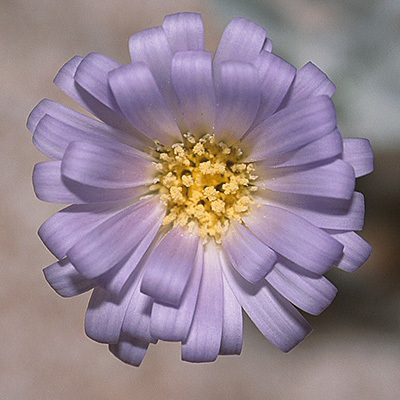 The daisy was recognised to be a new species and described in 2008 by Peter in the Journal of the Adelaide Botanic Gardens (895kb PDF). A further two populations were found in 2011 along the same breakaway system on the neighbouring property, Evelyn Downs. In 2016, O. arckaringensis was listed as Endangered under the federal EPBC Act (80kb PDF). The recent survey discovered several new population of the species. The search took more than 100 hours and covered more than 100 km of breakaway country. The survey team counted and mapped well over 2000 Arckaringa daisy plants and confirmed that the species is rare with quite specific habitat requirements. It was mainly restricted to breakaway sites that had a softer more powdery underlying substrate and were situated in less exposed areas. Voucher specimens of Olearia arckaringensis and other plants were collected for the State Herbarium and the Seed Conservation Centre. Such collections are vital to build plant knowledge and improve scientists’ ability to accurately describe and identify different species, whilst the stored seeds are a valuable insure against species extinction. 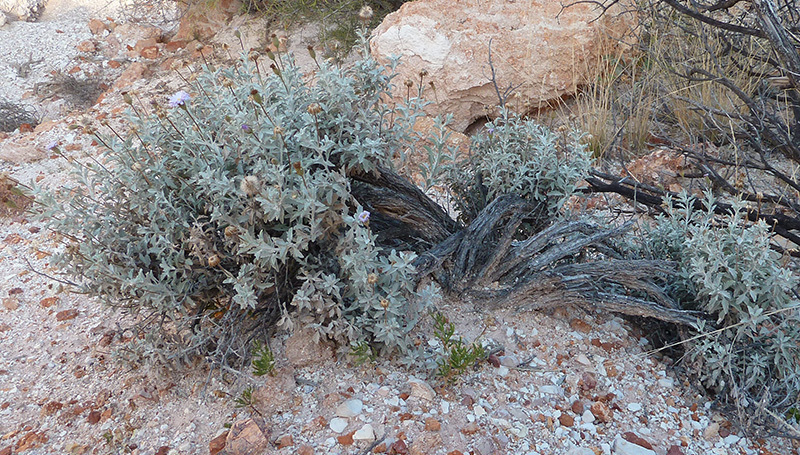 Olearia arckaringensis, old shrub with woody base. Photo: R. Brandle. The plant is a small, compact perennial shrub, usually to around 30 cm tall, with grey-green leaves and light violet-lavender flowers (occasionally white) borne on long stalks. 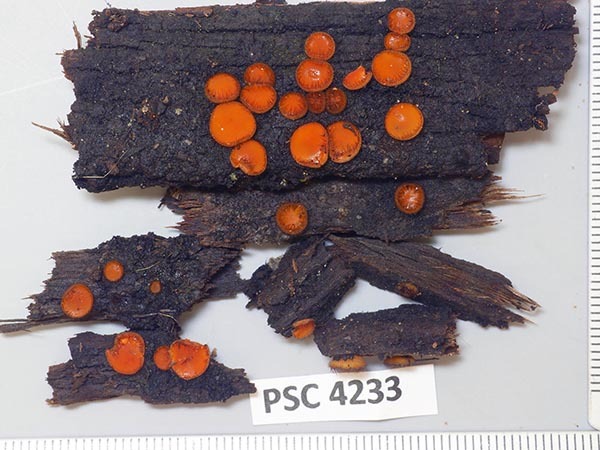 It rapidly develops a thick woody base from which it can regrow. More information can be found in DEWNR’s newsletter The Weekly and SA Arid Land’s news release. 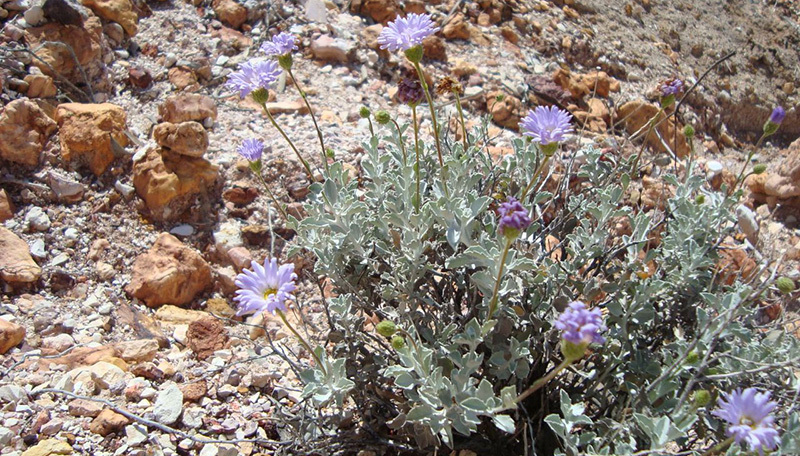 Olearia arckaringensis, plant in typical habitat. Photo: SA Seed Conservation Centre. This entry was posted in The Plant Press on 5 February, 2018 by Jürgen.